Our new wireless aircraft scales are here, check below for details! $6995.00 M2000-3-10CS Wired with 50ft cables and digital indication. Small aircraft, medium turboprops, light jets and helicopters. 10,000lbs each cell, three cell kit is capable of 30,000lbs total. One inch mounting on the top of the jack. HH2400-3-10CS is our wireless hand held aircraft and helicopter scale unit. No more wires or extension cords, just power up on battery power and your ready to weigh. $6995.00 HH2400-3-10CSwireless aircraft weighing kit. 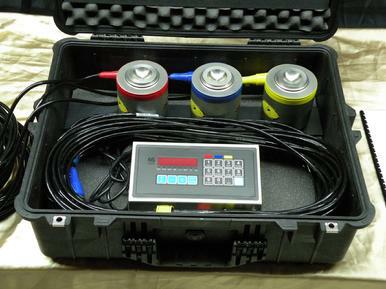 Three 10,000 lb load cells, wireless connection, hand held HH2400 transceiver, complete kit ready to weigh using wireless connection. Hand held shows you the individual weights of each point and your total weight with progressive key strokes. Optional printer is available as well as full upgrade to our laptop computer system if required. $7495.00 M2000-3-25CS Wired with 50ft cables and digital indication. This kit is great for light to medium size jobs, it will cover from small turbo props, F90, B350 Dash 8 to Jets, Beech Jet, Lear, Cessna, and other light to medium jets or turbo props. Three 25,000lb cells gives the user a 75,000lb total scale system. One inch top of jack mounting. $7495.00 HH2400-3-25CS Our hand held (HH) wireless kit is great for light to medium size jobs, it will cover from small turbo props, F90, B350 Dash 8 to Jets, Beech Jet, Lear, Cessna, and other light to medium jets or turbo props. Three wireless 25,000lb cells gives the user a 75,000lb total scale system. One inch top of jack mounting. $7495.00.00 M2400-3-25CS wireless aircraft weighing kit. Three 25,000 lb load cells, wireless connection, Standard laptop computer with USB antenna mounted on the laptop screen back, complete kit ready to weigh using wireless connection. $7995.00 P/N HH2400-4-5CS 5,000 lbs per cell kit, P/N HH2400-4-10CS 10,000 lbs per cell kit. These kits are for all four point helicopter requirements, float planes needing a four point weigh or other aircraft. Two case set, four 5,000lb cells, 10,000lb cells, cell kits are available. Our 4 cell wireless kit is here, no more wires, all items fit in a single case, HH2400 hand held wireless transceiver included with full calibration, ready to go when received. $9995.00M2000-3-50CSLC This kit works great for large jets like the GV, Falcon 900 and RJ's with large jack points. Three 50,000lbs cells giving the user 150,000lb total scale system. One inch mounting on top of the jack. Kit limited by jack point size, consult JAWS on your aircraft compatability. $9995.00HH2400-3-50CSLC Our wireless hand held transceiver kit works great for large jets like the GV, Falcon 900 and RJ's with large jack points. Three wireless 50,000lbs cells giving the user 150,000lb total scale system. One inch mounting on top of the jack. Kit limited by jack point size, consult JAWS on your aircraft compatability. $7495.00 Hand Held Indicator: HH2400-3-10KP OR Laptop Computer: M2400-3-10KP This scale system is great for shops that do not have jacks for every type of aircraft needed to weigh. Capable of small aircraft up to medium jets. Features three 10,000lb platforms for 30,000lbs total weight. Extra long 30 inch ramps, 12 x 16 platforms. M2400-3-15KP $7995.00This kit is the same as above but with a 15,000lb per platform rating. $6495.00M2000-3-5KP This kit is our small general aviation set, great for small FBO's IA's and all needing to weigh from light aircraft up to large piston twins and small helicopter. Platform size is 12 x 16 and ramps (not shown) are 16 inches long, units ship in cardboard boxes. $7495.00 M2000-3-10KP This scale system is great for shops that do not have jacks for every type of aircraft needed to weigh. Capable of small aircraft up to medium jets. Features three 10,000lb platforms for 30,000lbs total weight. Extra long 30 inch ramps, 12 x 16 platforms.This is our best seller! M2000-3-15KP $7995.00This kit is the same as above but with a 15,000lb per platform rating. $11,495.00M2000-3-100CS Large Jet kit, this kit features our M2000 indication and is available in a Box Set or Case Set configuration. Three 100,000lb cells, large jack point cups, this is our airline best seller! From RJ's up to Airbus and Boeing, this system has the capacity. Available in different cable lengths, call JAWS with your aircraft type and specifications. We also offer this kit in a 200,000lb per cell kit for Airbus requiring a 200K point cell, please call or e-mail for our quote on the larger system. Large jet 4 cell kit is now wireless! Easy to use and no wires. Range extending repeater included, laptop 15.6 inch computer included. Turn key kit ready to weigh your large jet aircraft. $12,995.00 M2400-4-100CS This is our four point large jet kit, Boeing, Airbus, MD and EMB. This is a must have for airlines or MRO operations servicing large jets. Top of jack mounting on one inch hole studs. This kit can be built to customer specifications and we can match mounting for your jack type. Call us today with your specifications. Our units are US power as well as Euro Power capable, please let us know which type of plug for Euro 220/50hz power you require. If we don't have it we will get it to match your power source. We manufacture all our kits in house, we have the capability for filling large orders or just one kit. We have many kits in stock as well as maintain a rental pool of scales for our customers support.